Impossible season. Extraordinary comeback. Epic Series. That sums up the Warriors record-breaking season and classic battle with OKC in the conference finals. For a crazy person like me, I can watch any regular season NBA game and find myself compelled. Yet, for most, the NBA regular season is of little importance. But, when a team breaks the Bulls record and does it with the brilliance and artistry of Stephen Curry, Klay Thompson and their cohorts, it's worth watching. Fast forward to the Western Conference Finals game five. The once unbeatable Warriors faced the brink of elimination, staring down three straight wins or an epic debacle. On one side, the Thunder played out of their minds, and it came out of nowhere, much like the 3-seeded Mavs in 2011. Kevin Durant (KD) and Russell Westbrook certainly did their thing, but it was the emergence of Steven Adams, the skill set of Enes Kanter and the unexpected reliability of Dion Waiters that put this OKC team in unchartered territory. They not only proved the Spurs takedown wasn't a fluke, but they also took the basketball world by storm by going toe to toe with the Warriors. Then, the Warriors pulled off the extraordinary comeback in remarkable fashion. It took their best at the end to hold off a game OKC team in game five, and then took jaw-dropping Klay Thompson 3s to keep the Dubs in it and ultimately steal game 6 to force the decisive game seven. And, of course, in game seven, the Dubs made a double-digit comeback to defeat OKC to move on to the finals. It was an epic series that may have saved an otherwise mundane postseason. Okay, so maybe Durant's decision will be far less dramatic than LeBron's. And, you can make the case this is more like decision 3.0, with LeBron going back to Cleveland. Either way, the aftermath of this series gets back to the storyline before it: what will Durant do? The most likely answer is that he'll stay in OKC for one more year, when Westbrook's contract ends, and then make a bigger decision. But, what's particularly intriguing is that before the playoffs, OKC just seemed like another team that had little chance of realistic championship aspirations. The fact that they took down the Spurs, came moments away from taking down the champs, and saw the emergence of Adams and other key role players, makes you wonder if that was enough to keep KD, and Westbrook, in OKC. It's a great debate. On one hand, it seems like the dynamic duo finally has a real supporting cast they haven't had since Harden. It also seems they are literally a spot up three point set shooter or two from an unstoppable offense. Think about it ... they really don't have a knock down, consistent three point shooter for when Durant gets doubled. That makes it hard for them to iso Durant at the end of games, when Westbrook ultimately seems to go on his turnover spree, as he did in game 6. But, if they just got someone reliable, perhaps Ray Allen, they might just be in business and too good for KD to leave. With that crazy OKC crowd and the talent level around him, it might be hard for him to leave. But, there's still a feeling amongst the basketball community that he might go home to Washington. While I'm not opposed to him staying in OKC, I believe it would be far more intriguing for him to leave and battle LeBron in the east. 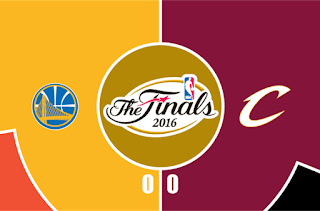 Think about it ... not too long ago, these two met in the finals, and it seemed as though this would be a classic rivalry for years to come. Then came the Harden trade and injuries. But, they were very close this playoffs, and would certainly build a nice battle in the east. Maybe LeBron would finally have some competition, and make the east fun again. The NBA isn't ditching conferences any time soon, so this is the next best thing. On to the finals! A great rematch on our hands, and one many wanted to see with a healthy Love and Irving back in the fray. The problem for the Cavs is that they get a Warriors team that has not only won a title, but also had the best regular season in NBA history. It was one thing when this team had never won a ship before and weren't as amazing as this season; it's another to take on the world champs in a historic season. That said, I expect a very good series. I think the Warriors top four defense, combined with their great depth, spacing and shooting, will be the difference. And, we will see why that Klay for Love trade rumor last offseason was not worth the Dubs time. Boy was I wrong for considering that one! Give me Warriors in 7. Enjoy the finals!